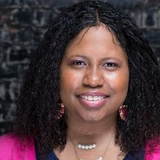 Veronica Appleton is an Adjunct Professor of Intercultural Communications & Organizations Communications at DePaul University. Appleton is also a faculty board member on the DePaul Committee for Contingent Faculty. Her research interests in diversity and inclusion, organizational communications and organizational culture. •First to publish a thesis in the program: "Assessing the Effectiveness of Patient Centered Medical Homes in the Context of Culture" (in press). Veronica Appleton updated their profile information. Veronica Appleton changed their profile image.